The Energizer® provides the benefits of a lightweight, roller-tipped aluminum rocker arm at moderate prices. They are manufactured from aerospace quality die-formed aluminum castings and CNC-machined to precise ratio-accurate specifications. 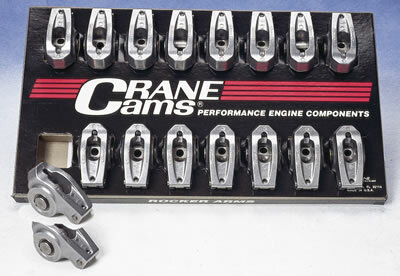 Like Crane�s more expensive roller rocker arms, they have heavy-duty precision-ground steel needle bearings and a heat-treated steel roller tip. They also include adjustable locking nuts. Perfect for street applications, Crane�s Energizer® rocker arms have been used by Detroit automakers for special engine programs. They are designed for use with camshaft/valve train packages that require valve springs with up to 450 lbs. (open) pressure.